USMLE Step 1 score has been analyzed in a previous article and while step 1 is a huge factor is deciding the interviews and match chances, step 2 CK scores are often just as important. In fact, the two scores together can decide for most part if you will be called for an interview. Analysis of the program directors survey by NRMP yields very interesting results for how step 2 CK scores affect your chances of interview and subsequently residency. The graph in figure 1 shows a ‘stock chart’ indicating the high, low and the mean scores. The subjects are arranged in the order of increasing average scores. 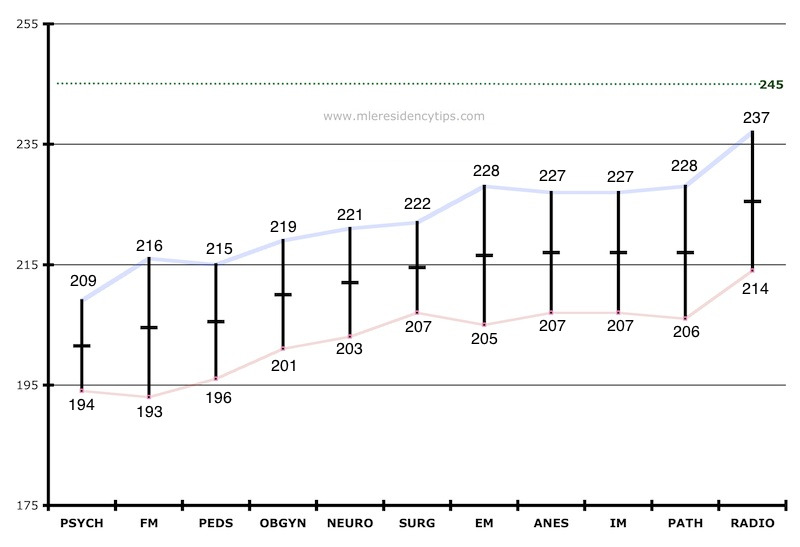 Scores that lie along the red line are the ‘lows’, which reflect the scores below which the programs DO NOT offer interviews to residency applicants. On the other hand, the scores along the blue line reflect the ‘highs’, which are scores above which the programs usually offer interviews for applicants. One must be careful to interpret this data because this is a composite of all applicants. The values are lower than those required of by the international medical graduates because they also include scores and data of graduates of American medical schools. An important facet of this result is, if you have scores lower than 195 in step 2 CK, then the chances of getting interviews in ANY specialty is very poor. However, there are inter-subject differences that are also apparent on this graph. Psychiatry, family medicine and pediatrics do not per say place that much importance on step 2 scores in comparison to internal medicine, pathology or radiology. For applicants that lie in between the blue and red lines, the success of their application may depend on other factors. These other issues are dealt in depth in respective segments of the website. Applicants who score 245+ can safely expect a few interviews irrespective of the subject they have applied. This is more so in case of pediatrics, family medicine and psychiatry. One must realize that scores are but one factor in the whole match process and should not affect your choice of applying for match. There are other things in your resume which can make a positive impact in your application process like research, USCE, observerships, volunteer work and other achievement can often help you just as much as scores. If you wish to be in touch and get the latest posts and updates, join me on Facebook or follow me on Twitter. i have usmle step 1 score of 230 and step 2ck score of 223..2 lors from us physician..i have graduated recently in 2015 from india..do i have any chance of getting an interview from internal medicine?